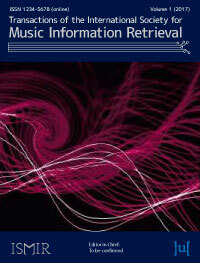 The Transactions of the International Society for Music Information Retrieval publishes novel scientific research in the field of music information retrieval (MIR), an interdisciplinary research area concerned with processing, analysing, organising and accessing music information. We welcome submissions from a wide range of disciplines, including computer science, musicology, cognitive science, library & information science and electrical engineering. TISMIR was established to complement the widely cited ISMIR conference proceedings and provide a vehicle for the dissemination of the highest quality and most substantial scientific research in MIR. TISMIR retains the Open Access model of the ISMIR Conference proceedings, providing rapid access, free of charge, to all journal content. In order to encourage reproducibility of the published research papers, we provide facilities for archiving the software and data used in the research. To avoid excessive cost to the authors or their institutions, TISMIR is published in electronic-only format. The Transactions of the International Society for Music Information Retrieval is currently accepting submissions for its first issue. View our submission guidelines for more information. The Transactions of the International Society for Music Information Retrieval is now open for submissions. For more information about the journal, or to complete a submission, please visit the relevant pages on our website.